Nette is a PHP Framework getting popularity world-wide. As per SitePoint’s survey Nette is 3’rd most popular PHP framework used for web development. This tutorial will help you to install Nette PHP Framework on CentOS, Red Hat & Fedora operating systems. First you need to add REMI and EPEL rpm repositories in your system. these repositories have updated packages. Use one of the below command as per your OS version and system architecture. To start with Nette configuration, we first need to setup a running LAMP server. If you have already running LAMP stack skip this step else use followings commands to setup lamp stack. Composer is required for installing Nette framework. So use below commands to download and use as a command in our system. If you already have composer installed on your system. Use following command to update it to latest version. Let’s navigate to web document root and use composer to create a new nette application using following commands. It will automatically download latest copy of Nette framework on your system under mypp directory. After successfully downloading all packages, assign proper permissions on file and folders in your application. 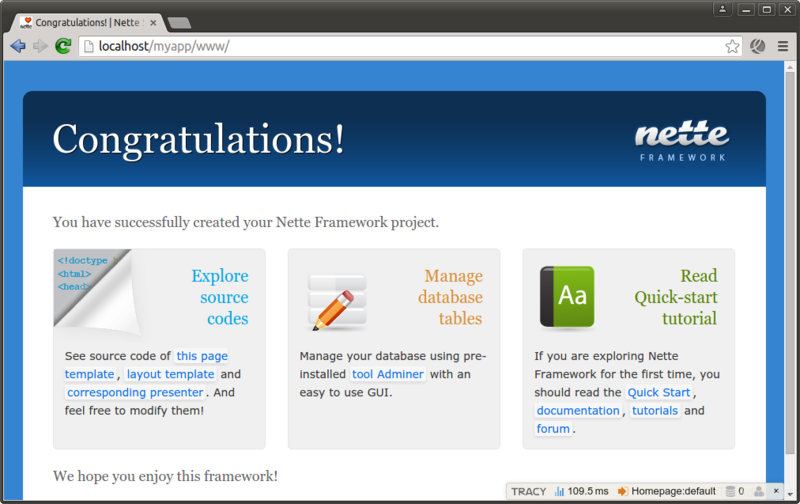 At this stage you have successfully configured Nette framework on your system. Restart Apache service and access Nette framework using your favourite web browser and start developing a great web application.